My name is Bill A and I live in Raleigh NC. 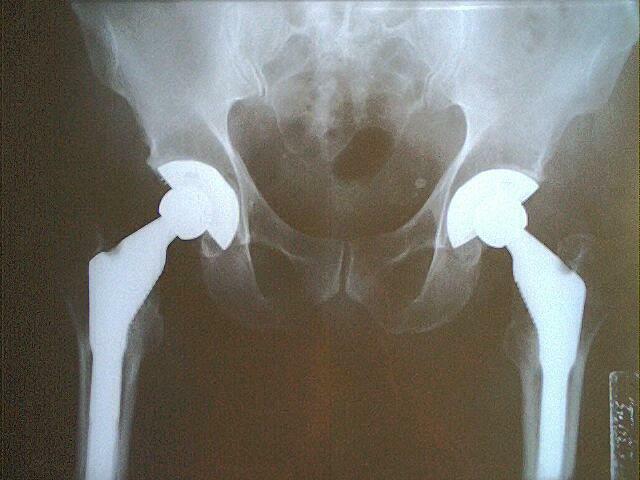 I have had both of my hips replaced using a non-adhesive attachment process. 2. The doctors were never able to identify a reason for the AVN occurring. 3. I was 53 years old when the hips failed. 4. I had been an avid mount bike rider prior to loosing my hips. 5. This picture was taken four years after the surgery. 6. My hips were replaced in June 1995. I spent 1 month in the hospital having them replaced followed by 6 months of physical therapy. I still do regular hip leg exercise to keep every thing working properly. The construction process was to drill different size opening into the center of my femurs making a tapered hole in the center of the bone. The oversized titanium rods were then driven into place producing a tight interference fit. The surface of the titanium rods had small metal loop on the surface to allow the bone to grow into the surface of the metal rods. After several months the bone had attached it self to the surface of the titanium rods thus insuring a solid bone to metal connection that would not come lose in time. The hip sockets were attached in the same manner and produce a solid long term bone to titanium connection. The titanium balls are held on the femur rods with a small metal "C" clip much like what you would find in an automotive application. Of course they don’t rust. A highly dense polymer material is inserted into the hip socket assemblies and held in place with a large metal "C" clip. The femur Ball unit then rides on the dense polymer material and thus replaces the original hip function. In time the polymer cushion will wear out and need replacement. The surgeon will then open the leg area, remove the large "C" clamp, remove the polymer cushion, remove the small "C" clamp, and remove the ball. He then replaces all four items and then you are read for another 10 to 15 years of operation.